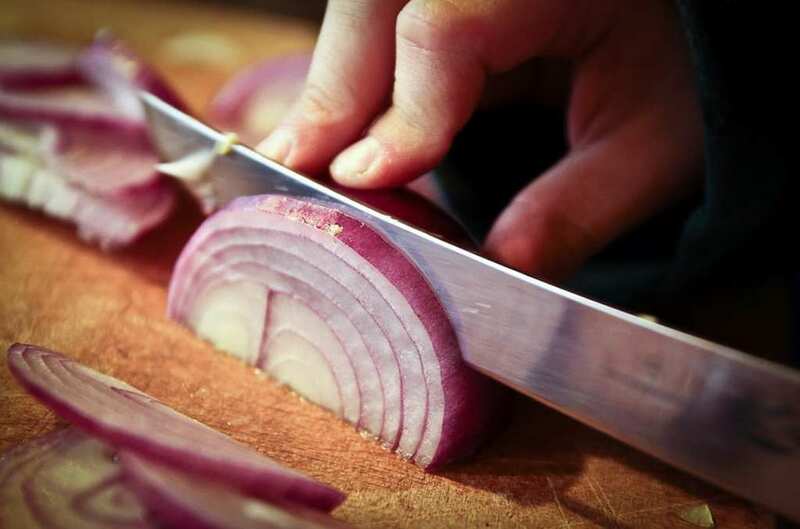 When you cut up an onion, you effectively break up its cells. When this happens, the amino acid sulfoxides in the onion change form and become sulfenic acids as you slice and dice your way through the vegetable. 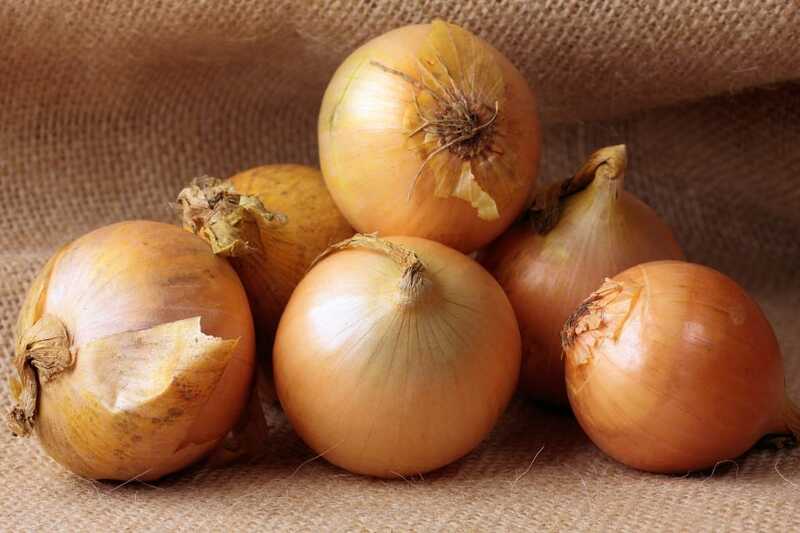 Because the enzymes in the onion have now been freed from their layers and structure, they are able to move about and mix with these sulfenic acids to produce a compound called propanethiol S-oxide – a sulfur compound which is incredibly volatile. As this gas wafts up into the air and towards our eyes, it reacts with the water and tears in our eyes to create sulfuric acid (which you probably all remember from your science experiments at school). The sulfuric acid produces a burning feeling in your eyes. As a natural reaction to any threats or dangers in our eyes, the human body automatically produces more tears in an attempt to wash away the acid. Are all onions the same? 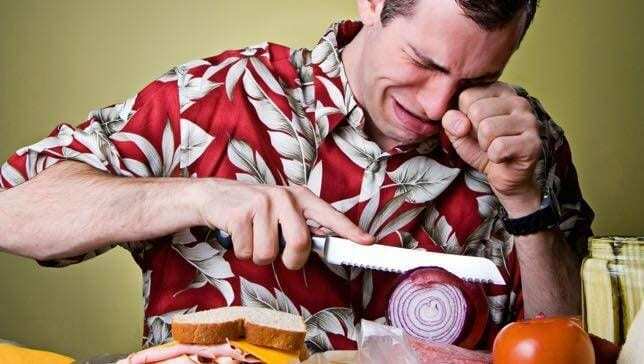 When cutting up different onions, you may have noticed that some of them make you cry more or less than others. This is because all onions are different and will all produce their own unique effects when you cut them. The sulfur content of each onion will vary depending on its variety, and the conditions in which it was grown. So, unfortunately, there is no real way to tell if it’s a light sobber or a full blown emotional breakdown. There are many ways to stop your eyes from streaming every time you cut up an onion. Put your onion in the refrigerator before you cut it up. As the onion cools, it slows down the reaction times for the acid and stops the chemistry from acting so fast when you cut into it. This can also be achieved by submerging the onion in water and cutting it there. Cook the onion before you cut it up. Cooking and heating up the onion deactivates the enzymes within the vegetable and stops the chemical reaction when you cut into it. Wear goggles. Okay, you might look silly doing this – but would you rather wear goggles for five minutes, or spend the next 20 re-applying the eye makeup that ran off your face because you couldn’t control your tears? Wearing goggles prevents the acidic vapors from coming anywhere near your eyes.